"Well, if practice sessions are anything to go by, Sunday's race should be a doozy!" No time for introductions, let's get right to the F1 UPDATE! *WHAT THE HELL WAS THAT? : Now THAT'S a race! Where to begin? First and foremost has got to be Robert Kubica's horrendous accident; he was in the process of passing Jarno Trulli coming into turn 7 and was pushed a little too far outside. His car left the track at high speed, got slightly airborne, brushed a barrier, then slammed almost straight-on into a concrete wall, which just demolished his BMW. The remains of the car then ricochetted back across the track, ending up on it's side in the run-off area of turn 8, some 150 yards from where the whole event began. 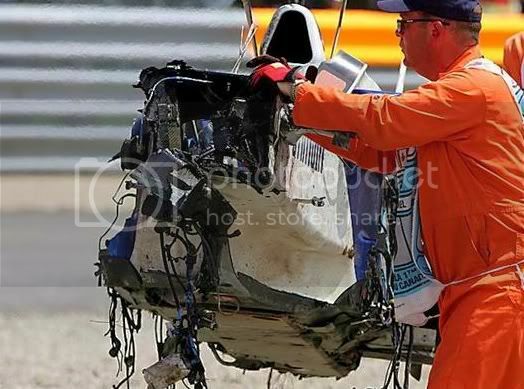 Kubica was motionless in the cockpit and we here at F1 UPDATE! feared the worst, though reports have come in that he only suffered a broken leg. Then you had three OTHER yellow flags, two cars black-flagged, Takuma Sato passing both Fernando Alonso and Kimi Raikkonen for position, and more. It all added up to an amazing race... even before you take into account Lewis Hamilton winning his first ever Grand Prix. Put that into the mix, and you have perhaps one of the greatest races of all time! *SHAKEUP ON THE PODIUM: Hamilton on the podium is no huge news, though his being on the top step is. That Grizzly Nick Heidfeld and Man-Mountain Wurz were 2nd and 3rd is AMAZING news, if only because it means that neither Ferrari or Fernando Alonso got on. In a race full of startling events, these were two of the most surprising. *DRIVER OF THE RACE: Lewis Hamilton would be a deserving enough person to give this award to... on any other day. For this race, however, we're going to give Heikki Kovalainen the honors. After a simply dreadful pre-race weekend that saw him blow an engine, destroy his suspension, and tear the back off his car, all on seperate incidents, he started today's race from dead last on the grid. He somehow managed to weave his way through all the events going on around him and brought his Renault home in an astonishing fourth place. Honorable mention goes to the aforementioned Lewis Hamilton. He's a rookie who's only been in six F1 races; he's never finished lower than third, and today he gets his first win. Not bad. *TEAM OF THE RACE: We here at F1 UPDATE! are having a problem with this one. Only three teams had both cars finish, McLaren, SuperAguri and Williams. McLaren doesn't deserve it: they may have had the winner, but Alonso had a miserable day when he should have been on the podium, due in part to the team calling him in to the pits before the pit lane was open, thereby earning him a 10sec penalty. SuperAguri only had one car in the points, and the other would have been a couple laps down under the old rules. So that leaves Williams, with one car on the podium and the other in 10th, as the winners of the TotR for Montreal. Yay. *MOVE OF THE RACE: No shortage to choose from today, and yet, there was no contest. On lap 68, SuperAguri's Takuma SUPERSato, having dispatched Ralf Schumacher two laps earlier, was all over the back of World Champion Fernando Alonso's McLaren. He had spent the two laps setting Alonso up, looking for an opening. Finally, down the straight he got a nice draft off the McLaren, pulled up close behind, and slingshotted past on the outside, simply powering by... and there was nothing Alonso could do about it. To make matters better, this was for SIXTH PLACE! The cheers from the F1 UPDATE! crew were deafening! To make matters better, earlier in the race SUPERSato had pressured Ferrari's Kimi Raikkonen into an error in the hairpin and blown past him as well. For superior passing not once, but TWICE, we MUST give Takuma Sato the Move of the Race. *MOOOOOOO-OOVE OF THE RACE: In a race full of the spirit of the bovine, one moment stood out above all the rest. On lap 38, Jarno Trulli and Nico Rosberg were side by side going into turn 1, dicing for position. Rosberg got slightly off-track and spun, a manuever that should have collected Trulli as well... but didn't, because Trulli had ALSO lost control and spun at almost the exact same time. In replays, it was like the two of them were pairs figure skaters, so identical were their oscillations. 9.5 from the American judge, and here's your Mooooooo-oove, boys! "The only way I got off the grid was by being pushed behind the wall by six stewards. Why are you talking to me?" - Jenson Button. On that sobering note, we end this edition of F1 UPDATE! with a fervent hope that Kubica is going to be fine, and that we'll see you here next week for the US Grand Prix! Coverage will begin on Thursday! Post contains 1092 words, total size 7 kb. 1 Bravo for an outstanding F1 Update and bravo for an awesome race. Hard to feel too sorry for Ralf. $20 million? Geez! Hope he saved a little of it. "Other than that, I'm having fun"
3 Personally, I think the Mooooo-ve needs to go to either the Strykers for both kissing the same wall one behind the other, or that pit crew (was it Toyota?) that must have been standing around having a group hug when their driver came into the box. The camera cuts to the pits, there's a car sitting there, then suddenly all hell breaks loose with guys running out to get to work. ...he hit what he called a "beaver," though it was probably a marmot. Ant said it got stuck in and under the front wing, too. Boy, think the SuperAguri pitcrew earned their money on THAT stop? 5 Rubbers gloves and squeege time. How big are Canadians on grilling up road-kill? Does the fact that it was hit by a Formula 1 car make it gourmet? 27kb generated in CPU 0.12, elapsed 0.2217 seconds. 47 queries taking 0.1783 seconds, 248 records returned.